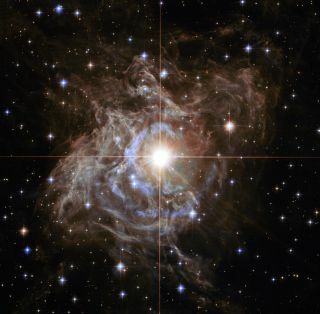 The brilliant star RS Puppis, surrounded by wisps of dust, looks like a "holiday wreath made of sparkling lights" in this stunning view from the Hubble Space Telscope, according to NASA. Holiday decorations glimmer under our roofs this season, and so, too, do celestial formations light up our largest home — the universe. To celebrate the season, scientists with the Hubble Space Telescope showcased what they called a "holiday wreath made of sparkling lights" in deep space made up of the dust around the brilliant star RS Puppis, which is visible from the Southern Hemisphere. The result is a dazzling (and festive) celestial display. And Hubble isn't the only space telescope getting in the Christmas spirit. Last week, NASA's Chandra X-Ray Center also released a "cosmic holiday assortment" full of the festive-colored galaxies, supernovas and nebulas to mark this time of year. The Chandra X-ray Observatory captured these stunning views of the cosmos to light up the holidays. They are. Top row (from top left): the supernova remnant E0102-72.3; galaxy cluster Abell 370; the Lagoon Nebula (Messier 8). Bottom row (left to right): the Orion Nebula; the Triangulum Galaxy (Messier 33); and Abell 2744, a collision of four massive galaxies. The space eyes that caught these six sparkling sights belong to the Chandra X-Ray Observatory, which launched in 1999 and bears the nickname of Nobel laureate and astrophysicist Subrahmanyan Chandrasekhar. It's tasked with observing high-energy signals from the universe, and the space telescope is a helpful tool for research into dark matter, planetary nebulas, galaxy clusters, black holes, quasars and supernovas. The images also use data from instruments like the Very Large Telescope (VLT) in Chile, the Hubble Space Telescope and the Very Large Array (VLA) in New Mexico. The top left photo shows E0102-72.3, a multi-colored ring of material produced by the explosion of a massive star in the nearby Small Magellanic Cloud, according to the Chandra X-Ray Center. The blue and purple colors are from Chandra data, and reveal high amounts of oxygen — in fact, this vibrant feature has enough oxygen for "thousands of solar systems," the space agency said. Abell 370 shines in a deep winter blue color at top center of the frame. Several hundred galaxies make up this galaxy cluster, a gargantuan type of celestial body. Copious amounts of million-degree gas emits X-rays, which appear as the diffused blue regions in Chandra data. The reds and green colors come from Hubble optical observations. The pink freckles across the top right image of the Lagoon Nebula are high-energy light emissions (like X-rays) picked up by Chandra. Also known as Messier 8, this image is merged with optical observations, seen in the blue and white colors, from Mt. Lemmon Sky Center in Arizona, according the Chandra X-Ray Center officials. The Orion Nebula, which looks like a crocheted scarf stretched out across the sky, appears as a purple color with VLA radio emission observations. The blue speckles in the image sitting in the frame's bottom right side are individual young stars, observable by Chandra because of the energetic X-rays they release. Messier 33, also known as the Triangulum Galaxy, glows in the frame's bottom center. Chandra's pink X-ray data reveals neutron stars and black holes in this Milky Way neighbor, agency officials said. And pictured in the frame's bottom right is the monumental structure Abell 2744, a colossal collision of four separate galaxy clusters found 3.5 billion light years away from Earth. The scorching gas appears blue in Chandra data, and the rest of the colors come from optical observations from VLA and the Subaru Telescope in Hawaii.